I had just picked Hudson up from school Monday when my father-in-law called me. Wednesday came around. My father-in-law picked me up and off we went. Twenty minutes later we pulled into the parking lot of a gun shop and shooting range. It became clear what we were doing when he started unloading guns out of the trunk of his car. Today would be the day that I fired a gun for the first time. We walked into the gun store. I signed in and signed a waiver. 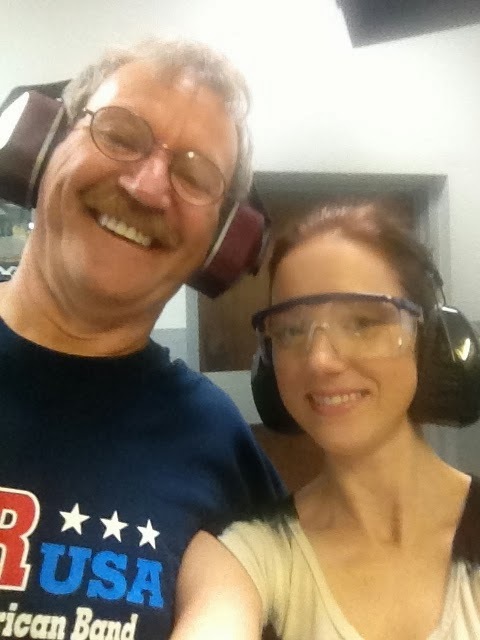 My father-in-law bought some ammo and we walked into the range. The first time I heard a gun fired, I jumped. I’m not sure why, but I didn’t expect it to be so loud. “Ear protection,” he said handing it to me out of his bag. He took out one of his guns and showed me the safety, showed me how to hold the gun and how to fire. I watched him fire a few times, the bullet casings flying all around. An employee from the store came in and reminded me that I supposed to be wearing eye protection. “Your turn,” he said handing me the gun. My hands were shaking. I held the gun in my hand, acutely aware that I was holding an object with the ability to kill and so was everyone else here. I was suddenly aware of the trust involved. That the only thing stopping anyone here from killing someone was their own conscience, morality, and mental stability. I took a deep breath, aimed, and fired. The kick caught me by surprise. After a few rounds, I felt panicky. I didn’t trust my hands and I put the gun down. I watched my father-in-law for a while as he shot a .45. I took a deep breath to calm my nerves. My father-in-law helped adjust my hands and I fired. The noise and the kick was incredible. I put the gun down. He shot for a while longer. He taught me some more about the gun and the bullets. Back in the store, he had me hold some of the combat-style weapons. I don’t think shooting is for me. I get the appeal. I get why people like it, I really do. I just can’t get over the noise and the implications of what a gun can do. That does not mean I am against other responsible people enjoying this sport. I am simply saying it is not for me. We chatted in the car about the conceal and carry class he took. We talked about weapons he carried in Vietnam. We talked about how blind people could now carry a weapon in public in Iowa and we both agreed that was crazy. We went to lunch and continued discussions about gun legislation, everything from background checks, to magazine limits, to assault weapons. We didn’t always agree. We did agree on more that we disagreed on. And most importantly, we listened to each other. There was no anger. There was no arguing. There was only the exchange of thoughts and information. Then my father-in-law, a card-carrying member of the NRA, agreed to write to his congressman. I will always be grateful for this day with him. For what he taught me, but most of all for the conversation. Conventional wisdom says never discuss politics or religion in polite company. I have never understood that. Those things are important. It’s said that too many tempers flare when talking about these things, but maybe instead of banning topics, maybe we should examine the way we talk about them. Maybe the problem is not the topic, maybe the problem is how we talk to each other. I now know for sure that it is possible to talk with someone about touchy subjects even when the two parties are coming from two different sides. All is takes is some listening along with the talking. So far all the things my father-in-law taught me that day, for this I am the most thankful. I so agree with you about listening. "Discussion" doesn't have to be synonymous with "persuasion." And agreeing to disagree is a valid option. What a gift to have such a meaningful relationship with in-laws - bonus!